Hoppin grew up in Providence, RI. During a long illness, he began to paint. Upon his recovery he studied at the Artist Students League, NY, Academie Julian and Ecole des Beaux Arts, Paris. He did some portraits but preferred landscapes in the style of Impressionism, inspired by outdoor color and light. Traveling all over the world, he was very kind to other painters and gave generously of his time and effort to get them started. His influence on those around him was profound and lasting. 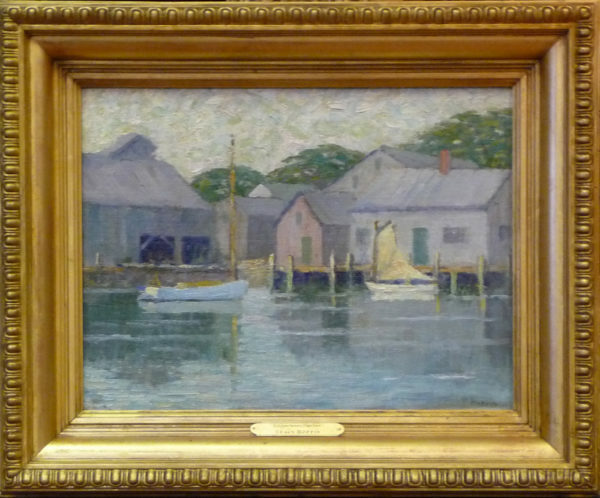 He was a member of the North Shore Art Association, Gloucester, Salmagundi Club and Century Club. He exhibited at National Academy of Design, North Shore Art Association, Gloucester, Pennsylvania Academy of the Fine Arts. Comments This painting is in excellent condition, in the original period frame, also in excellent condition.